The ODS SELECT statement restricts the output to the “ParameterEstimates” and “GoodnessOfFit” tables; see the section ODS Table Names. The LOGNORMAL primary option superimposes a fitted curve on the histogram in Output 4.27.1. The W= option specifies the line width for the curve. The INSET statement specifies that the mean, standard deviation, and skewness be displayed in an inset in the northeast corner of the plot. Note that the default value of the threshold parameter is zero. In applications where the threshold is not zero, you can specify with the THETA= option. The variable Deviation includes values that are less than the default threshold; therefore, the option THETA= EST is used. Output 4.27.2 provides three EDF goodness-of-fit tests for the lognormal distribution: the Anderson-Darling, the Cramér–von Mises, and the Kolmogorov-Smirnov tests. The null hypothesis for the three tests is that a lognormal distribution holds for the sample data. The -values for all three tests are greater than 0.5, so the null hypothesis is not rejected. 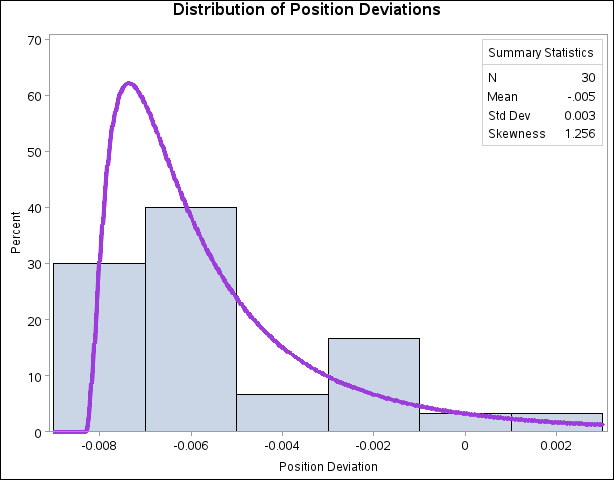 The tests support the conclusion that the two-parameter lognormal distribution with scale parameter and shape parameter provides a good model for the distribution of position deviations. For further discussion of goodness-of-fit interpretation, see the section Goodness-of-Fit Tests.